I have a few days between Christmas and New Year to take advantage of the fact that the north greenhouse is empty, now that all of the poinsettias have been given away. 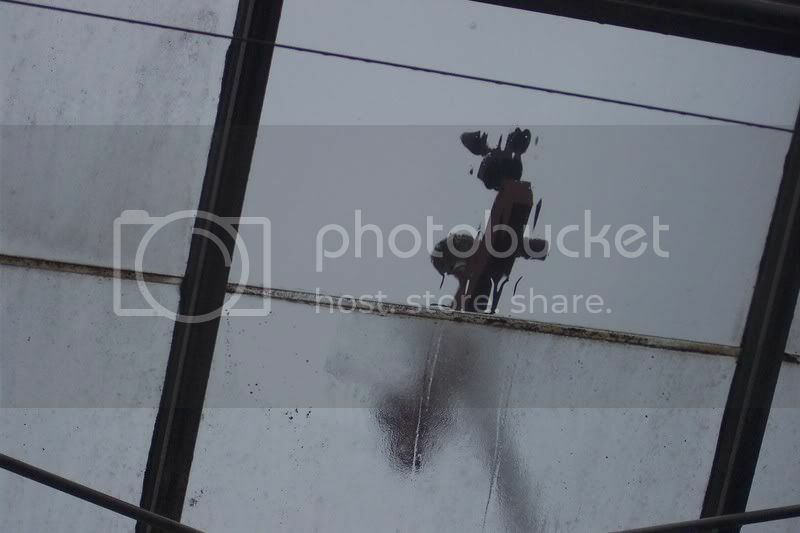 One of the jobs I have been wanting to do for a while is wash the inside of the glass on the greenhouse. It is covered with algae, mildew and other assorted nasty looking stuff. Since the peak of the roof is 15 feet from the floor, I bought a telescoping window brush handle to reach the top without having to stand on a ladder. I tried using a stream of water to rinse off the dirt but, it just sticks to the glass. At one time I used an expensive window concentrate to wash the glass. After running out of that stuff, I found out that ordinary liquid dish soap works just fine. Also, since dish detergent contains a rinsing agent and, I use RO water to rinse the glass, they turn out sparkling clear. If I didn’t have access to 300 gallons on pressurized purified water for rinsing, I’d have to sqeegee all that glass… now that would be a huge task! The worst part of this job happens when you are washing the roof and skronky water runs down the pole and your arm into your arm pit…yuck! Look at the difference between a washed pane of glass and the adjacent unwashed glass. How much light do you suppose is lost to all of those dirty panes of glass? The plants will certainly appreciate the effort and the rest of us don’t have to look at all that grime. Have you seen the Amaryllis for sale at the stores? They are a bulb which is quite large that either come in a box and must be planted or are pre-planted. Large blooms of red, white, or pink are the common colors at the “Big Box” stores. In the catalogs there are some unusual varieties. For example; white with streaks of red or green, pink blotches in the middle of the petals or my favorite; white petals edged in a fine line of red, called ‘Picotee’! Any of these colors of Amaryllis make great presents since they are sure to bloom. Over watering or under watering makes no difference right now. Amaryllis bulbs, at this time of year, will bloom no matter what is done to them. Some have two or three blooms from one bulb, and the blooms last for a long time. So, if a present is needed for your eighty-five year old aunt or anyone else who is hard to buy for, Amaryllis bulbs are the answer! It’s been a while since I last posted an article here, but that doesn’t mean that things have slowed down in the garden and greenhouse. 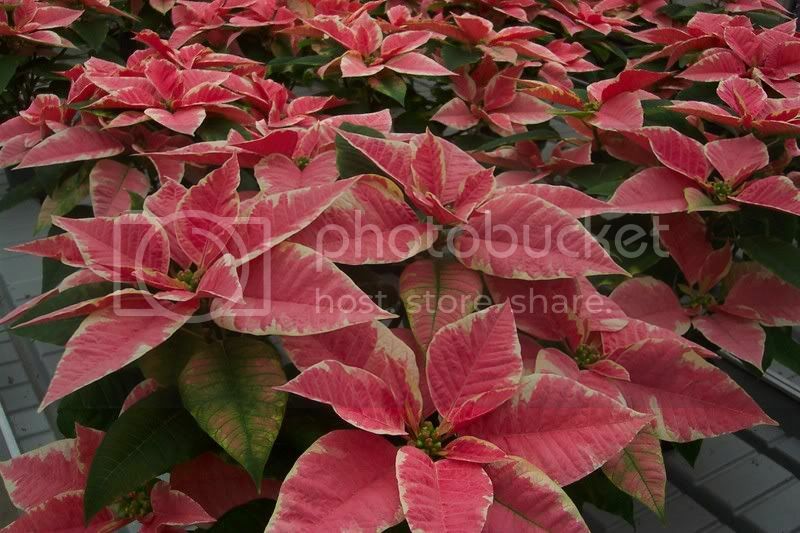 Christmas is just around the corner, so for us that means Poinsettias are the focus of our work. Actually, the poinsettias have been in the greenhouse since September. As a result, here in the greenhouse, Christmas has slowly crept up since that time. We’ve watched them grow from small, green cuttings to full colorful plants. We’ve been so used to the greenhouse being full of Poinsettias, that it’s hard to believe that they will all be gone soon. Some of the plants have already been given away last week. 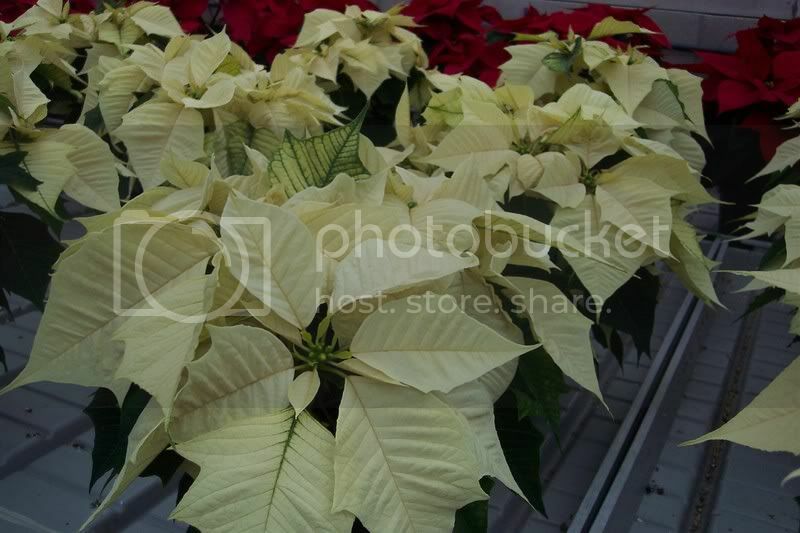 Many people are not aware that there are different Poinsettia varieties, just like there are different varieties of tomatoes. Through the years, plant breeders have developed varieties for not only color, but, also growth habit (short or tall), leaf shape (smooth or lobed), maturity date (early, mid, or late) and other characteristics. 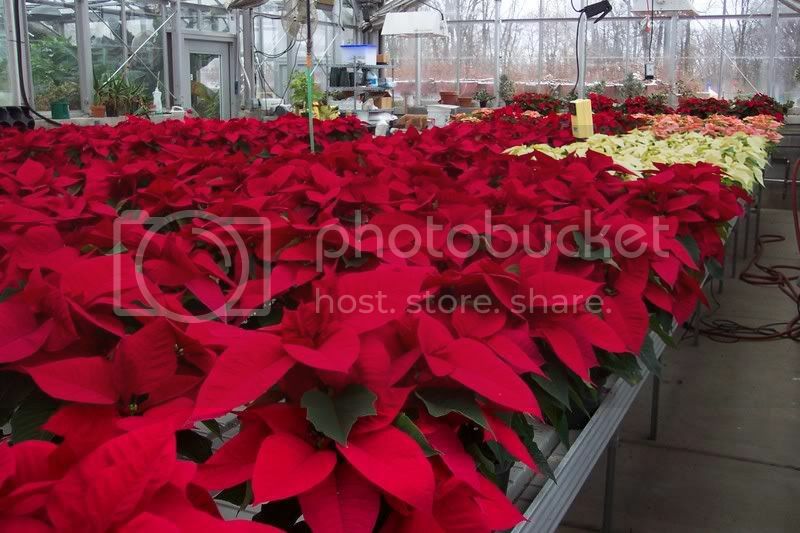 One very important development in Poinsettia breeding is the ease of production. The old varieties needed to be covered with a black shade cloth during a period of their life cycle. Any light, even from street lamps at night, could cause the crop to fail to bloom. Fortunatly, this is not as critical anymore. This year, we are growing three varieties of Poinsettias. Premium Red is our main crop, we have about 150 of those. Sonora is our white variety, there’s about 40 of them. Marblestar is a pink and white variety. We have about 50 of those. 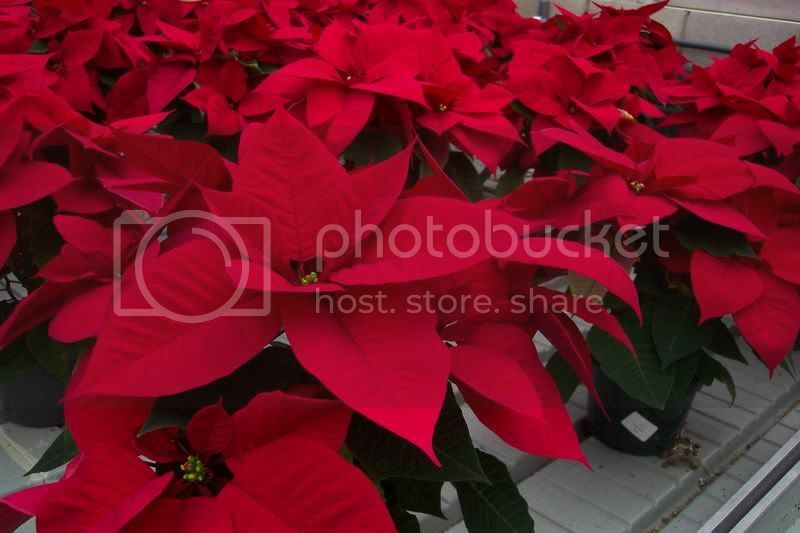 of Almost all of our Poinsettias are grown in 6″ pots, except for a couple dozen 10″ pots. 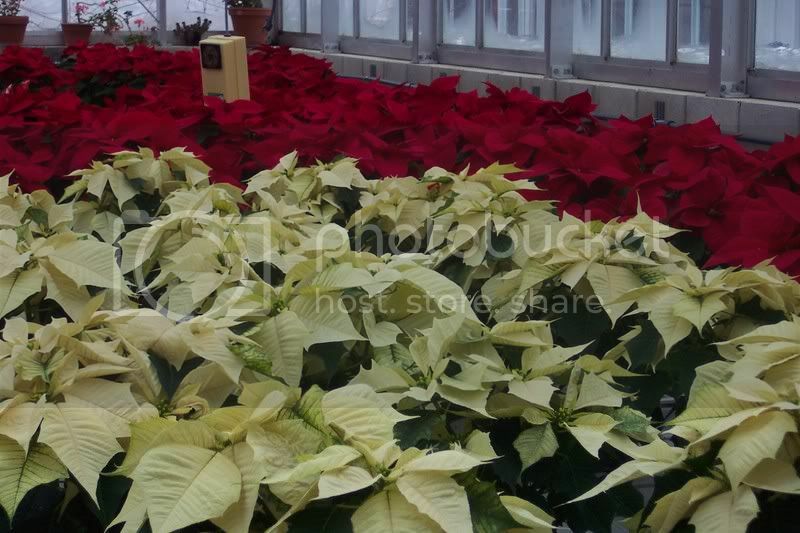 In two weeks time the greenhouse will be empty of Poinsettias except for a few that we will continue to grow. A couple will be saved for taking cuttings for next year’s crop, while a few more will be left to grow into larger plants for Christmas of 2008.